Since January 1971, COTA (Central Ohio Transit Authority) has been the official bus service for the city of Columbus, Ohio and surrounding areas. COTA is currently in the process of deploying CMAX, an all-new rapid transit service. CMAX is a limited-stop service and will connect passengers to major destinations in and around downtown Columbus. According to the official COTA website, the new service will improve service, improve mobility and reliability in congested areas, be less expensive for travelers, provide more travel options, and improve pedestrian access and safety. 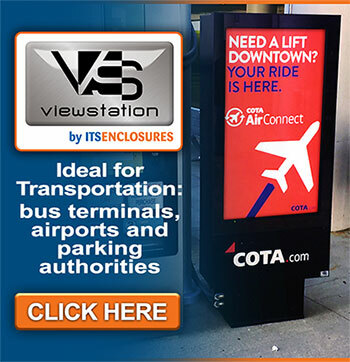 In the summer of 2014, COTA reached out to ITSENCLOSURES, whom they had worked with before on a different digital signage solution, to glean pricing on fabricating an all-weather, LCD enclosure for a bus stop shelter makeover across the city of Columbus, Ohio. The plan was in the initial stages, but it was anticipated that the overall project would take place over the course of a few years. COTA's proposal included a prototype bus shelter at the company's headquarters, located at 1333 Fields Avenue in Columbus, Ohio. 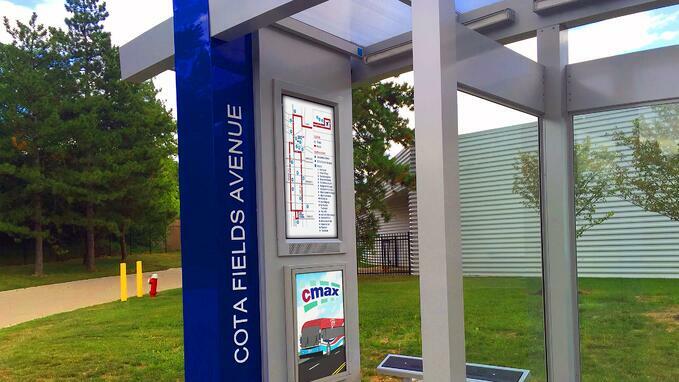 COTA desired to install eye-catching, digital signage at every CMAX bus stop and the project entailed a custom, environmental LCD enclosure to be housed in a large pylon, attached to a bus shelter. Considering the complexity of the project and having worked successfully with ITSENCLOSURES on previous transportation projects, COTA felt confident that the new CMAX signage strategy would become a reality with ITSENCLOSURES' durable, heavy-duty products. Being in Columbus, a city that experiences all four seasons of weather, COTA required various thermal management options as they were concerned about freezing, snowy winters, and humid, sunny summers. In addition, COTA required high bright, commercial-grade monitors, so that passengers could view the bus routes at all hours of the day. Another critical concern for COTA was the possibility of vandalism and destruction of the screens. After weighing different options, COTA decided to install a custom, fan-cooled LCD enclosure that is recessed into a bus shelter. To study and review the enclosure in various weather conditions, COTA built a fully functioning CMAX shelter to prototype in the winter of 2016. 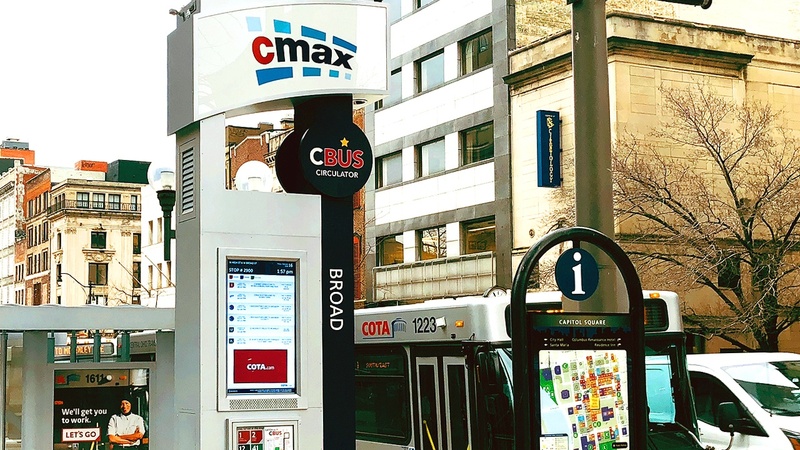 COTA plans to install a combination of pylons, single and double sided, at each CMAX bus stop to display real-time information, including arrival and departure times. Each enclosure is equipped with a 47-inch, high bright LCD and a thermostatically controlled fan/heater system to protect the electronics in the extreme, central Ohio weather conditions. The enclosure houses a media player to ensure seamless content delivery. In all, COTA purchased 77 LCD enclosures designed for 47inch monitors, which will be installed throughout 2017 and into the Spring of 2018. The innovative enclosures will be housed in a total of 64 pylons throughout Columbus. COTA anticipates that the digital signage will help passengers find the correct bus route and arrive at their destination in a timely manner. CMAX bus stop shelters and busses will change the way that people travel in Columbus.